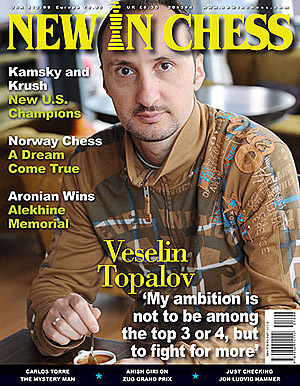 Veselin Topalov’s return to form in elite chess is perhaps one of the brighter stories in the past year. After losing to Viswanathan Anand a couple of years ago, Topalov got married and seemed to drift away from the spotlight. Some opined that he had become disinterested in chess and even he stated he was “sick of chess”. Of course, his return has been dotted with mediocrity, but with his victory at the FIDE Grand Prix in Zug, Switzerland he may have confirmed his notion that he is ready to make a run for the title once again. Topalov’s impressive performance (with +6) is the coverage story and there is an extensive interview discussing a wide range of topics including his match against Anand. The former FIDE champion made a very poignant admission. If you want to be World Champion, you don’t have to be the strongest player; you just have to win the World Championship. Sounds a bit trite, but Topalov offered this as a take on the upcoming championship match between Magnus Carlsen and Viswanathan Anand. Topalov believe the match will be very difficult for the Norwegian. This summer there have been a cadre of strong tournaments and the Alekhine Memorial in Paris, France and St. Petersburg, Russia was one of them. Both Boris Gelfand and Levon Aronian won the event, but there were some sparkling games including Ding Liren-Levon-Aronian. The rising Chinese star’s win was even praised by the loser. A very interesting feature in included on Mexican legend Carlos Torre who was a contemporary of Raul Capablanca and Alexander Alekhine. Most chess players have no doubt heard of the “Torre Attack” but may not know much about the man who gave the opening the name. It is a very compelling story of a man who spent formative years in New York matching wits with the likes of Capablanca, Alekhine, Emmanuel Lasker and Geza Maroczy. It is a very lengthy piece with some very interesting twists and turns. The issue also covers the U.S. Championship with Macauley Peterson giving an account. This year’s event was an upgrade from previous editions given the enhanced coverage. The organizers at the Chess Club and Scholastic Center of St. Louis, or simply St. Louis Chess Club had garnered the services of FOX Sports to help give the tournament maximum reach. With Maurice Ashley on the teleprompter and Jennifer Shahade and Yasser Seirawan on the commentary, it made for appealing viewership. Having covered the tournament live, I can certainly attest that excitement was high both at the club and in the surrounding St. Louis area. The city has become the hotbed and a centrifugal force for growth of chess. While New York may still be considered the nostalgic chess capitol, St. Louis is now the driving force. New Yorkers Gata Kamsky and Irina Krush gave some interesting reflections one their winnings. 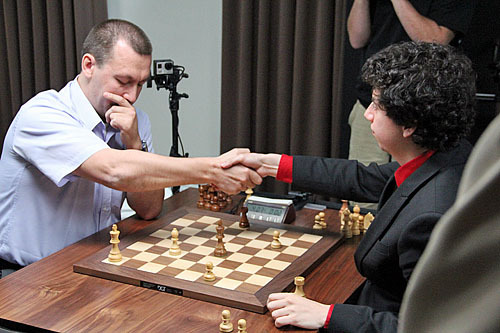 Alejandro Ramirez congratulates the Gata Kamsky after tiebreak win.